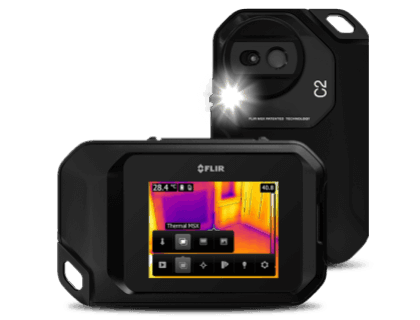 Learn about the Flir C2 Powerful & Compact Thermal Imaging System for building or home inspection. Includes features, pricing, and FAQs. The Flir C2 is a thermal imaging camera system designed for a wide range of building and electrical applications. The pocket-sized thermal camera stores up to 500 sets of images, has MSX Image Enhancement, and full radiometric flexibility for powerful reports. High-sensitivity detector that shows more details. Full radiometric flexibility for powerful reports. The Flir C2 retails for $499.00. Where can I buy the Flir C2 thermal imaging camera? You can buy the Flir C2 thermal camera from sites like Amazon and eBay, or directly from Flir.com. Can I create reports with the Flir C2 thermal imaging camera? Yes, the Flir C2 camera's JPEG images store 4,800 individual thermal measurements so that you can analyze and edit reports using Flir Tools software. What are some Flir C2 Powerful & Compact Thermal Imaging System alternatives? Flir E6 Thermal Imaging Infrared Camera w/ WiFi. Flir C3 72003-0303 Pocket Thermal Camera with WiFi Connectivity. Flir E5 MR77 Thermal Imaging IR- Camera with WiFi. AEMC 2121 40 1950 Temperature Infrared Imaging Camera. Flir TG167-74701-0104 Spot Thermal Camera with Image Storage.